The power of saying NO!!! 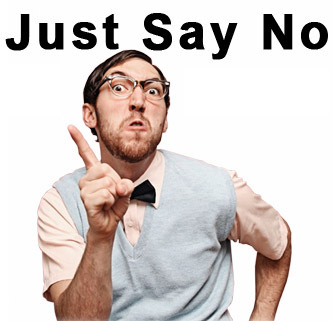 Saying no is perhaps the most important productivity tool that exists. Saying no is an art. It is also perhaps the most difficult thing to do for most people. I used to dread the occasions where I knew I will have to say no and I used to prepare for such situations for days. Now, I almost look forward to saying no to people and I actually enjoy the process! Find out how the change happened. 1. You are doing everyone a favour by saying no. -Giving the person an opportunity to look for someone who can do the job better. – Avoiding negative feelings about the person. 2. Visualize the alternative (to saying no) in vivid detail. – You will feel bad and will curse yourself for accepting the task. – You will do a bad job. – You will hate the person for putting this on to you. – The person will hate you for doing a bad job. – You should not have said yes, if you were not going to do a good job, the person will tell you later. 3. Remember what happened the last time you said yes! 4. Use the situation as an opportunity to build a better relationship. If you like the person and don‚Äôt want to burn your bridges then having to say no can actually be a great opportunity to improve your relationship with this person. This is very much possible, provided you take the extra effort to honestly explain to the person why you cannot do this and why you value the relationship and that you really believe that by doing a half-baked job you will be hurting the relationship. Sometimes,¬†saying no is just pure joy! The joy gets magnified if you do not provide any reasons at all! 6. Go overboard explaining why you cannot. The explaining might make the person feel better than if you had said yes! 7. Use the big‚Äìpicture test. Focus on the big picture. What are your ultimate goals and objectives? Is this task in sync with your goals? If not, just say no and rest assured that you have made the correct decision. 8. Use a bit of cunning if you need to (in this order). a. Negotiate. If you can take this off my plate, then I can do that. Or if I can get resources for this, then I can do that. b. Postpone. Let me think about it and get back to you on email. c. Deflect. I cannot do this BUT I can help you with that. d. Bluff. Carry around your dummy calendar (choc a bloc of course) and show it to the person! e. Throw the ball back. Ask for help in deciding how you should fit in the new task on the list of priorities (especially if it is your boss). f. Lower expectations. Point out that you might be able to do everything, but not to the usual high standards that are expected. g. Googly or curve ball. Say yes, then call back or SMS in the next 10 minutes to say why you cannot do it. Why 10 minutes? Well because that is the average time required for homo sapiens to come up with a good excuse. 9. If they get really pushy, switch gears and think of it as a game. There is no way you can say yes NOW! Smile and tell them so. 10. And before we end, here are a few statements for you to practice! I know you will do a wonderful job yourself. I am in the middle of several projects. I am not comfortable with that. I need to leave some free time for myself. I would rather decline than do a mediocre job. I am not taking on any new responsibilities. I would rather help out with another task. Let me hook you up with someone who can do it. I am not the most qualified person for the job. I do not enjoy that kind of work. I do not have any more room in my calendar. I hate to split my attention among projects. I need to focus more on my personal life. I need to focus on my career right now. This really is not my strong point. REMEMBER!!!! It’s very easy to over-promise and then under-perform. Be realistic about what you can accomplish and don’t feel like you have to agree to your client’s every wish. If you can’t do it, you can’t do it and you’ll occasionally have to tell your clients the truth. Being overloaded, but still promising to meet their needs doesn’t bode well for you, and will only result in disappointed clients later. Also, though it’s hard to turn down new projects, you’ll have to do that from time to time if you’re already overloaded. If you take on more than you can handle, you’ll short-change current projects and disappoint new clients. Shalu Wasu is a creativity consultant and trainer based in Singapore apart from being guest faculty at select institutes.